These nine photos were recently discovered in an attic. 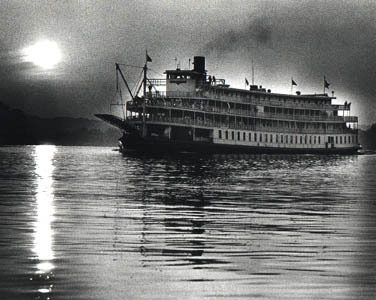 They were taken in the early 1970s, when the Delta Queen was struggling against a federal law that banned wooden boats. 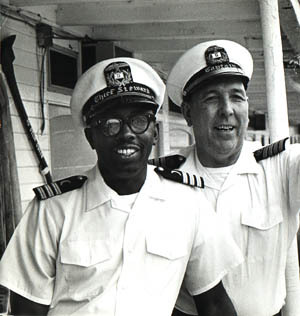 In this photo, Franklin Myles, Chief Steward, is seen with Ernest Wagner, Master of the ship. E.J. Quinby, chairman of the board of directors, calliopist. 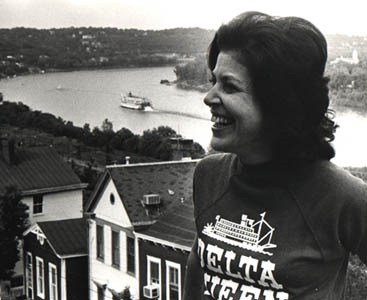 Betty Blake, Vice President and head of the Save the Delta Queen campaign. 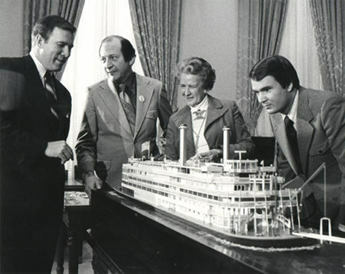 Congressional Representative Leanora Sullivan meets with Bill Muster (to her right) and other Delta Queen executives to discuss steamboat construction. Unknown photographer. 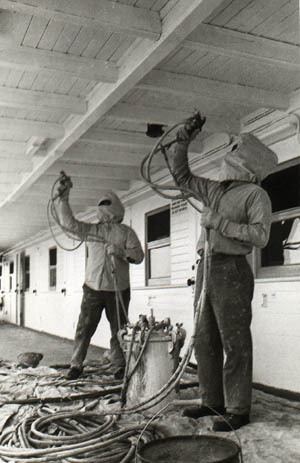 Fire resistant paint is one of the Delta Queen's safety features. 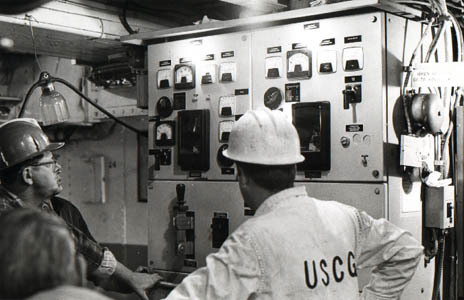 An officer from the U.S. Coast Guard inspects the engineroom. The boat in stormy times. A celebration when the boat wins exemption from the law. 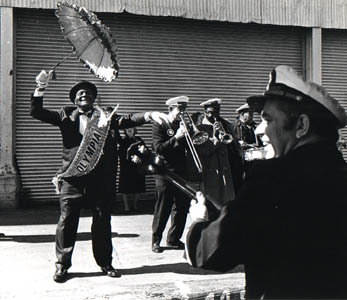 Performers at a Save the Delta Queen victory party. Join the cause to preserve America's national historic landmarks. 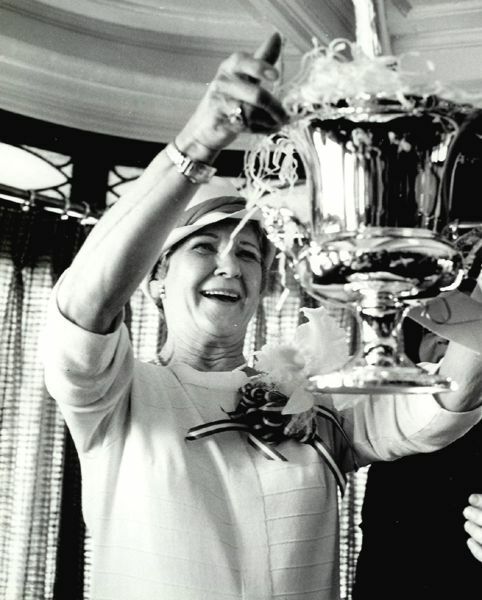 Leonore Sullivan, the steadfast Congresswoman who stood by the Delta Queen to get the exemption. 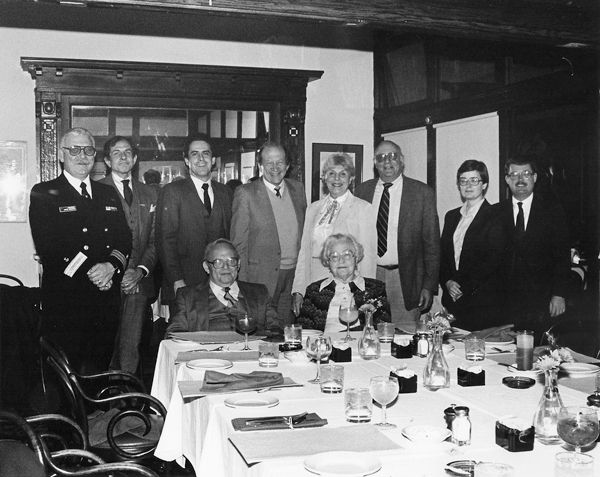 Commodore Harold DeMarrero, Gordon Greene, Patrick Fahey, Senior Vice President Delta Queen Stamboat Company, Bill Muster, Shirley Bernstein, Ben Bernstein - President, BB Enterprises, Joyce A. 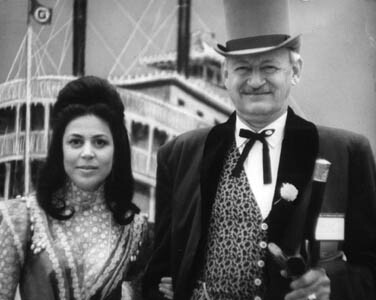 Early - Senior Vice President - Finance of Delta Queen Steamboat Company, Ron Marcou - Senior Vice President - Passenger Services, Delta Queen Steamboat Company. 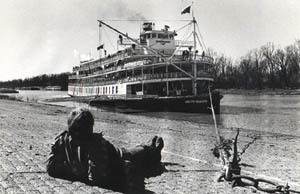 Foreground - Frank Fried, President, Delta Queen Steamboat Company. Travis C. Vasconcelos: Nori, That would be 1984. De Marrero came to the boats in 1981, Franklin Fried in 1983...so it is 84. Sorry for the correction! Nori Muster: Hmmm, but why would my dad be there in 1984? Don Sanders: Why are the Bernsteins there? What's going on? Travis C. Vasconcelos: Wasn't this the dedication of the statue of Capt. Mary B. Greene up in Covington? Seems I have seen this picture before and that is what I am more than willing to say was the occasion. I know the DQ was in town for the event. 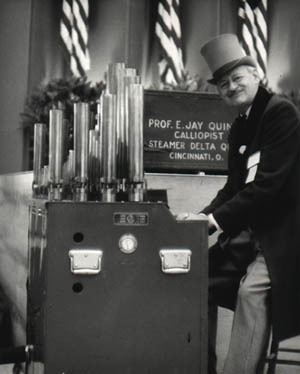 And a rare appearance of Gordon Greene as a steamboating event...has to be the dedication of the statue! Travis C. Vasconcelos: Wait, the guy at the table (foreground) isn't Fried...and the lady next to him is Letha C. Greene...she passed not too long after the statue was dedicated...so this HAS to be the deal. Oh, and the Company was still in Cincinnati then, or there would have not been all the brass in attendance if they had to fly from NOLA! Nori Muster: Let's ask Gordon. Maybe my dad came out for that. There was a caption taped to the back, but it could be inaccurate. I found this in a box of my father's photos a couple days ago. Travis C. Vasconcelos: Perhaps he could answer some questions. Seeing his mother in the picture dates it before 1985...and all that Cinti office brass gives it the same date. Commodore Harold De Marraro makes certain it is after 1981...and the Bernsteins weren't even operating boats till 1979...so it was after that. If I had to be pinned down to a location, I'd say it was the MIKE FINK (The Bernsteins restaurant boat in Covington, KY). Sure looks like her midship Main Deck Dining Room with the window shades pulled. Nori Muster: Somebody get Gordon Greene over here, we need his opinion! Melville Jerome Hartsough: lol Nori I left around 85 and I know Harold was not Commodore prior to 84. Nori Muster: I wish the caption would have had a date!